Monogram Asia Space Jakarta is the first pop-up facility that houses a gallery, a cafe, a travel corner and a retail store. Photography lovers can sign up for talk or workshop, get inspired by mounted works of international and local artists, buy a film camera or strap that you've been yearning for, browse through volumes of books and magazines, or just talk about photography over a cup of coffee. Our exclusive cameras and accessories retail corner is managed by Drew and Barry offering signature labels like Barber Shop, Gordy, Annie Barton 1972, Tie Her Up and Oberworth. While the delicious coffee is freshly brewed and served by the charming baristas of the Kanawa Coffee and Munch chain. The bookstore is curated by Monogram Asia that showcases a wide variety and genres of photography books and magazines. Among these are a limited number of autographed and special edition copies of Fan Ho, Michael Kenna, Daido Moriyama and more. While stocks last of course. Michael Kenna, the world renowned long exposure and landscape photographer, Bellamy Hunt, the famous blogger, hunter and trader of vintage film cameras and Kenro Izu, the photographer of ancient and sacred places of Asia and founder of a not-for-profit organisation called "Friends Without a Border", graced the soft launch of the Monogram Asia Space with their presence all the way from Seattle, Tokyo and New York, respectively. 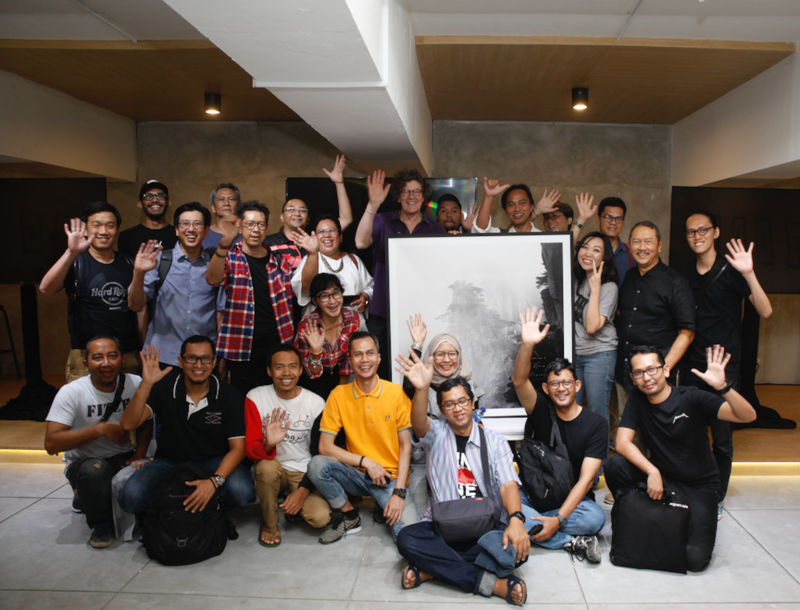 They were joined by local Indonesian photographers like Gathot Subroto, Benny Asrul, Niky Tanjung and Safir Makki to name but a few. Besides the launch, many came to listen to lectures by Michael Kenna on opening day followed by Bellamy Hunt the next day. The pop-up gallery space in Jakarta is now closed. Thank you all for visiting our Space and making it a success for the last 6 months. Look out for the next exciting MGA Space in another city in Asia soon.